SK-II Unveils Their First-ever IT Guy & IT Girl! You are here:Home » SK-II » SK-II Unveils Their First-ever IT Guy & IT Girl! How would you define the IT factor, or how would you identify an IT guy or gal? The IT factor, in my opinion, is the X factor which relates to someone who seems to exude a certain charisma & charm. What do you think? SK-II recently unveils their first-ever IT Guy & IT Girl at Isetan Scotts during an exclusive media event; the charming pair are none other than Host & former MTV VJ, Uttsada Panichkul, & famous local musician, Sara Wee. According to the dynamic duo, the winning combination lies in innate confidence, relevance to the current scene, ability to inspire others & more importantly, having good, well-maintained skin. This echoes a recent finding SK-II found in a recent online poll conducted among more than 50 respondents on ‘What makes up The “IT” Factor?' – that for majority of women & men, their skin is really the proof of beauty. From its introduction over 30 years ago, Facial Treatment Essence remains one of SK-II’s bestsellers today & an icon in the beauty industry. Facial Treatment Essence is powered by over 90% Pitera, SK-II’s signature ingredient, which acts directly on the five dimensions of texture, radiance, firmness, spot control & wrinkle resilience. This formula, which has remained unchanged over the last three decades, has been proven to shift skin’s five dimensions to attain visible improvements towards crystal clear skin. In a real-life, interactive beauty counselling test with Magic Ring – SK-II’s latest skin analysis device – led by SK-II Beauty Counselor Trainer, Cindy Cheong & Utt, Sara puts her skin to the test. Her results were evident that the proof is all that’s needed when it comes to crystal clarity. For more info on remarkable skin diagnostic tool, read about my experience with the Magic Ring & see how it can help you too. Here's Sara serenading the invited guests with her sweet & melodious voice. 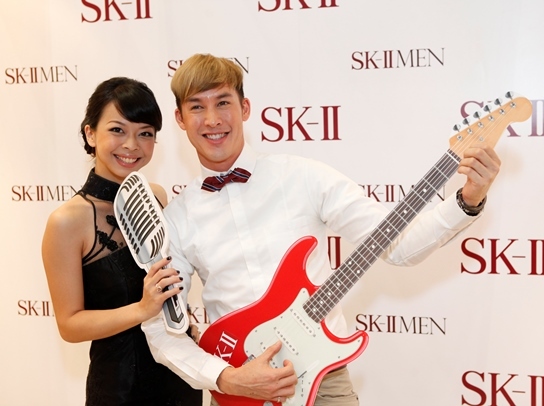 The media also got to take home a pair of SK-II Facial Treatment Essence for both men & ladies. SK-II Facial Treatment Essence (75 ml) SGD 99, (150 ml) SGD 168, (215 ml) SGD 209. SK-II MEN Facial Treatment Essence (75 ml) SGD 99, (150 ml) SGD 183.
wooO! sk2 products! that's awesome! Splendid events and I had a great time looking at the pictures. Lucky you for attending the event plus the products. Nava, glad you've enjoyed the tour! Sara skin surely sparkle! How nice to be able to attend SK-II events and get to take home their generous goodies bag. DS, she has really good skin! Should've heard her sing! I have just ordered an SKII cleanser online. It is only a 6g tube for trial. It is said to be sent from Hong Kong, hope it is a genuine one. How nice you always get free goodies from SKII. You are lucky to attend these kind of events and also receive free products. wow, that's a very expensive goodie!!! you're so lucky. You sure very lucky get to attend this wonderful event and the take home gift is excellent. Thanks for sharing all the beautiful pictures. Amelia, u're damn cute lah! Better late than never. Hahaha! Thks for coming by every post!